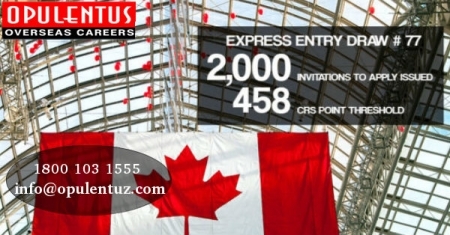 In the Express entry draw held on 8th November, by IRCC, 2,000 applicants were successful to receive the Canada ITA. The invited can now apply to obtain a PR status. The candidate having the lowest CRS score here was 458. This draw was the 77th of its nature to be held after the introduction of the Canada Express Entry Program in 2015. It was the 27th draw for the current year. This draw was the foremost after the introduction of the new procedure. Several candidates obtained a ranking and the scores were tied. The express entry goes for the ranking of the profiles based on the time and date of submission. Profiles staying for a long time in the pool get a priority for Canada PR ITA, over the profiles which have been submitted at a new date. The feature of tie breaker was introduced by IRCC in June 2016. Thus there is a possibility that all candidates who had a score of 458 points received an invitation in the present draw. Immigration Minister of Canada had signed two express entry draws last week. These draws witnessed the presence, of only the candidates, who are eligible through the Federal Skilled Trades Class. Candidates who had a provincial nomination received the Invitation to apply. Candidates who are successful, to receive the provincial nomination, through the popular enhanced PNP stream, which is aligned with Express entry, are entitled to get additional 600 CRS points. This meant that they are sure to receive the ITA for Canada PR in the succeeding Express entry draws. Draws which are specific to the programs that were held last week should not be considered as a norm but as an exception in Express entry. 795 applicants received ITAs in these draws. If a candidate is interested in migrating to Canada we are happy to offer the best guidance and tips for success.fill out a free evaluation form or contact us at [email protected] or call us 1800 103 1555. One of our experts will meet your expectations and provide answers to queries.